This past June, Devon Canada Tax Director Shiraz Nazerali was elected and named a Fellow of the Chartered Accountants (FCA) by the Institute of Chartered Accountants of Alberta (ICAA). Every year the ICAA recognizes accountants who have demonstrated a lifetime of attributes who best reflect the profession. In his career at Devon for the past 15 years, Nazerali has been a strong leader, for both the company and the tax industry. Through the years, he has built and led a strong tax team, initiated many planning projects resulting in significant savings for the company, and won multiple tax cases for Devon, including a major tax case with the U.S. Supreme Court. “Shiraz’s knowledge, experience, and history with Devon have been key to the significant value he and the tax team have created,” said Tracy McCorriston, vice president of accounting at Devon Canada. 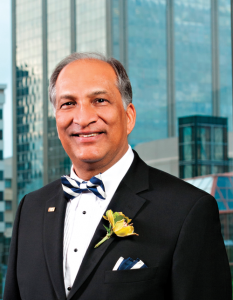 In addition to being a professional leader, Nazerali is also recognized for his thoughtfulness and giving spirit, volunteering his expertise over hundreds of service hours in 2014 alone, not to mention the many more he has served throughout his career. Several Chartered Accountants nominated Nazerali for the award, supplemented by letters of support from several other CAs and senior leaders of various organizations. Cumulatively, they covered four decades of his work with these institutions in various volunteer positions. His colleagues at Devon and those within the Chartered Accountant group had only good words to say about Nazerali’s contribution to the tax industry and the lasting impression he has made. In addition to this prestigious award, Nazerali was also previously honored with the Distinguished Service award from the ICAA in 2010; special recognition awards from CAPP in 2004, 2013, and 2014; and a Distinguished Service award from TEI in 2013. He previously headed TEI in Canada and is responsible for the TEI Canadian Annual Conference in Ottawa, where in May 2014 he hosted the Minister of National Revenue and the Canada Revenue Agency Commissioner. Join us in congratulating Nazerali on this extraordinary achievement and thanking him for his service to our industry and our association.